The girls from the PriPara series meet with the girls from other Pretty Rhythm series. That's about it, there's no silly jokes or antics like they usually do in PriPara, the movie is a tour of the PriPara songs. At some point in the movie the audience has to choose between 4 different routes to watch from the Pretty Rhythm series songs. Nothing happens that could be called plot. The movie has better animation but the artwork stays the same. Can't expect much from a children's movie. The CG animation stays the same. If you like the songs from the series, then you'll like the ones from the movie. There's no character developing at all. Just music and songs. 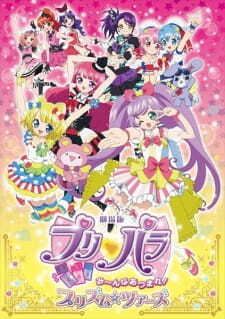 Watch the movie if you'd like to watch 90 minutes of songs from both PriPara and Pretty Rhythm. Don't get me wrong, I enjoyed it. Refraining from spoilers, there was a time PriPara recycled the same dialogue four times with the same scene added in! Lack of imagination and nearing nonsense, but its understandable looking at how the scene played out. The characters came off as flat to me and they weren't as exciting when compared to the actual show, though the return of- *cough* watch it yourself to find out! If I reviewed this on a critic level, it'd get a "3". Though, being a kids movie and enjoyment the main element I use for this genre, it gets a "7". Its a fun ride, just a sloppy one! Poll: Will this movie ever get subs?